How to Use Checkout 51 | What is Checkout 51? What is Checkout 51 and how does it work? 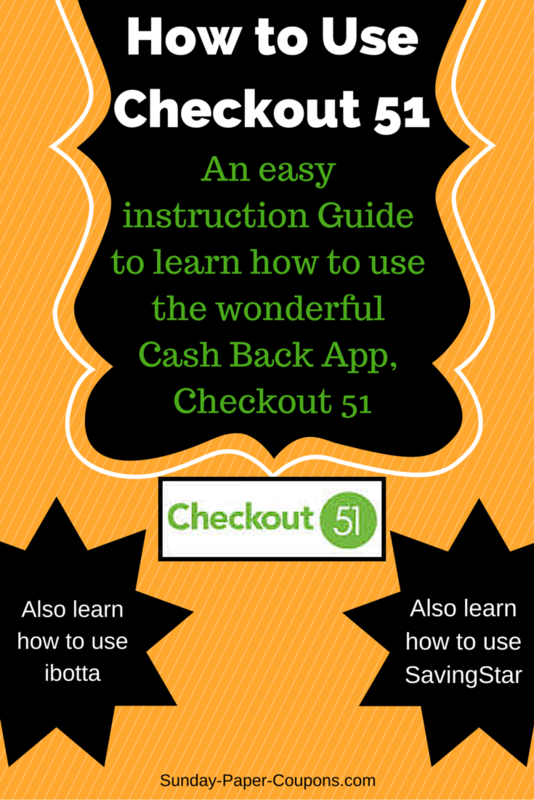 The Beginner's Guide to How to Use Checkout 51 below will help you to easily understand this free app, so that you too can start saving money with it. Checkout 51 is a cash back grocery app that lets you earn cash back when grocery shopping. And, unlike many of the other grocery apps, Checkout 51 works on your computer, cell or tablet. Like most other cash back apps, you can use Checkout 51 in addition to using paper manufacturer coupons, store coupons (paper or electronic), store offers (i.e., BOGO), store loyalty cards, and even other Cash Back Apps, like ibotta, SavingStar, or Snap by Groupon! It's yet another form of "stacking" and you can save big and even make money on some products by using multiple means of saving, such as these. The cash back items/offers are not additional coupons that you have to take to the grocery store; so if you hate to clip coupons, you can still save by using the cash back apps! But, you'll definitely save more money by combining (stacking) your savings by using the apps in addition to paper and other electronic coupons. One of the best parts about using many of the cash back grocery apps, is that they often offer cash back for items that you almost never get regular paper coupons for, such as: fruits, vegetables, and dairy (milk, eggs, cheese...)! So dive in below and start saving! The Cash Back will then be credited to your account. When your account reaches $20, they send you a check! Money back for purchasing groceries that you were going to buy anyway - you can't beat that with a bat! Still have questions? Visit Checkout 51's FAQ page.